Canton center Meaghan McKenna skates with the puck past a defender during Saturday’s decisive 7-2 win over Medfield. WALPOLE — As his Canton High girls warmed up for their match against Medfield at Iorio Rink Saturday night, first-year coach Dennis Aldrich milled about with a big smile and a look of concentration on his face. It was game day again, and he could not be happier. “I’ve been a fan of these guys for a while,” said Aldrich, who attended a number of games last season with his 11-year-old daughter, Meg, who had friends with sisters on the team. So far those expectations have yielded results for the 8-1 Bulldogs, who have only lost to defending Division 2 state champ Duxbury, 3-0, and have run off four straight to start off 2013, including Saturday’s 7-2 triumph over Medfield. Players of the Week and Tim Healey’s Top 10 boys’ and girls’ hockey teams from high school programs south of Boston. Leading the way for Canton, as she has done all season, was senior captain Meaghan McKenna , one of three Bulldogs with a pair of goals in the game — one of which came after she passed two Medfield defensemen and easily fired a backhanded shot into a mostly open net. Even with all her success, the second-line center (13 goals, five assists) has had to adjust this season after being taken off the same line as her fellow captain and classmate, Meghan Lennon . “We both have experience being on the team,” said Lennon, who mirrors McKenna’s point total with five goals and 13 assists. McKenna and Lennon are just two players, though, and Aldrich said depth has been key in the Bulldogs’ early success. 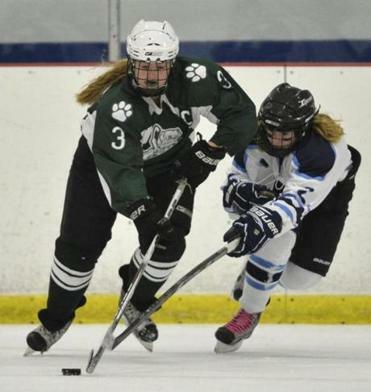 Canton features a strong supporting cast with three more double-digit scorers — freshman left wing Emily Lanci , junior right wing Katie Kelleher, and freshman left wing Julie Nagel — and a blue line led by senior captain Bethany Kelly . In all, Aldrich said he consistently fields a team with three lines of forwards — the third of which kills penalties, allowing him to come right back with his top line — and five defensemen. Canton has a pair of goaltenders, junior Emily Buckley and freshman Lindsey Nolte , who split time and have save percentages over .900. The team went 14-8 and reached the second round of the playoffs last season under former coach Kelly Rider . But this year the Bulldogs have stepped it up at least one notch, a change the captains suggested was a result of Aldrich’s focus on fundamentals. Bethany Kelly said Aldrich spent about a month tweaking the lines and defensive pairings, but now the lineup is consistent — and working. Aldrich has instituted power-play, penalty-kill, and forechecking systems suited to his players’ strengths. There is a lot more structure this season, and Aldrich said the athletes have been soaking it up. This is both literal — daughter Meg and the daughter of assistant coach Nick Maffeo chart shots during games — and figurative. The team’s coaching staff — Aldrich, Maffeo, assistants Brian Wanless , Sarah Handman , and Kelly Robinson , and goalie coach Marty Sasin —is made up entirely of Canton natives. “We’ve very much created a family environment around here,” said Aldrich, whose deep Canton roots include playing hockey at the high school, graduating in 1979, serving as an assistant on the boys’ team for six years, and being director of Canton girls’ youth hockey. The Canton ties haven’t escaped the players, including the appreciative captains. Next winter, for the first time, Norton High will field a varsity boys’ hockey team. The School Committee approved the program by a 4-0 vote last week. Rick Palin , president of the Norton Hockey Organization, a parent-run group created to support hockey in the town, said it was a long time coming. “It never got far in the past because it was easy for people to say it’s too expensive,” said Palin, whose son, Jake, an eighth-grader, plays on a town team. Palin said the school system will not fund the team, but the Norton Hockey Organization has already accrued about 80 percent of the $30,000 required for the program’s first year through fund-raising with athletes’ families and local businesses. In addition, the athletic user fee ($250) will be doubled. The only Tri-Valley League school without hockey, Norton will play an independent schedule for the first two years before applying to join the TVL. The Archbishop Williams boys’ program (9-1) has been clicking on all cylinders for much of the season, but last week was particularly successful. Archies enjoyed wins over Central Catholic (9-1), St. Joseph Prep (8-1), and Dover Sherborn (9-3). The Bishops are averaging 6.7 goals per game. Tim Healey can be reached at timothy.healey@globe.com.